I have always seen wigs and hair pieces as a bit of a challenge - When a bride would sit down and say to me 'I have really fine hair so there's not much you can do with it' I always accept the 'challenge' and go full steam ahead giving the bride a full bodied hair look (mainly through setting in heated curlers and a lot of back combing) - When someone asks for an Amy Winehouse Beehive, I never shy away - more backcombing! and when someone wants a nice full bun I am happy to style this for them. Well, This is the first year that I have been entered into the wedding industry awards - Thank you for entering me ! 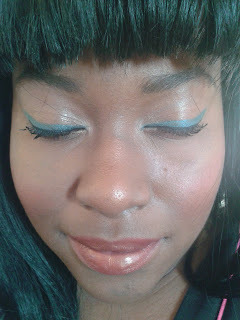 For some reason a lot of make up artists don't feel confident when applying make up for darker skintones - I love dark skin tones - make up really enhances their skin and colours look vibrant and fresh all day long. Mistakes made on darker skin tones - If you use a coloured powder to set the foundation, the skin can end up looking quite 'ashy' and not so fresh, therefore I always use a colourless (white) fine powder which simply sets the make up without changing the skin tone. 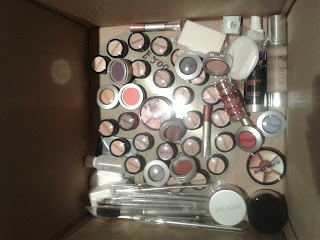 This is what a box of Supercover Make up looks like - exciting or what? Just take a look at all those colours - foundation colours, eyeshadow colours, lipstick colours plus brushes, primers and powders - I am a little girl in a sweet shop with all these products! I have been using Supercover for the last 3 years now, although I was introduced to the company who makes supercover - Beauty republica back in 2002 and have been using various items of their make up throughout the last 11 years. I use Supercover foundation on all my brides, models and clients as I can always find the right colour for the correct skintone without having to mix a few colours together, the pigment is enough to conceal uneven skintones, yet it is light enough so it doesn't feel heavy on the skin - The foundation itself always lasts for at least 12 hours and remains looking fresh for the entire day. I made the decision to start up this business after I met so many talented students on my adult leisure courses that I teach at Sussex Downs College. I taught many students the art of Make Up Artistry and some were very talented, in fact so talented that I could not let their talents go to waste. With this in mind, the wellbeing angels was formed - I had a team of Massage therapists, Beauticians, Make up artists and Hair stylists who could visit different workplaces to bring wellbeing into the workplace! I was still in the very early stages of setting this business up when I took my children to their school disco, here I met Katie Weir, a Personal Trainer who thought that she would be a great asset to the wellbeing angels team so that I could also offer exercise in the workplace - that, teamed up with me being a Zumba Instructor and hey presto, something else for workplaces!